In law, restitution is often ordered by a court in order to achieve fairness, preventing the unjust enrichment of one party to a civil lawsuit. In addition, restitution is often ordered in criminal sentencing, requiring the defendant to make monetary amends, or perform some act that benefits the victim of the crime, or the public in general. Restitution in a criminal setting is usually made in addition to fines and/or jail time. To explore this concept, consider the following restitution definition. 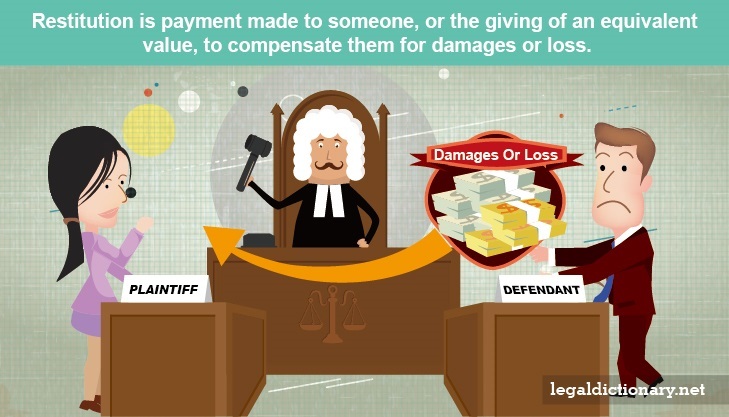 Payment made to someone, or the giving of an equivalent value, to compensate them for damages or loss. Amelia and Bob hire professional photographer Dan to take pictures at their wedding, specifying that, in addition to photographing the wedding ceremony, photos are to be taken of their families and the reception. Amelia wrote a check for Dan’s entire $5,000 fee when they hired him. Dan delivers a wedding album to the couple, explaining that there had been an electronic malfunction of the camera after the ceremony, and none of the family or reception photos turned out. Dan offers Amelia and Bob a partial refund of $200, which they refuse, feeling they deserve the entire amount back, as he ruined their wedding memories. When the parties meet in civil court, the judge determines that, although it was through no fault of his own, Dan did not provide the couple with adequate value for the contract. The judge also determines that the couple did receive partial value, and so orders the photographer to refund half of his fee, $2,500. As Jennifer slows to a stop at a red light, another car, driven by Amanda, slams into her from the rear, shoving her car into the car ahead of her. Jennifer’s small car is totaled, and Jennifer sustains a broken leg and several lacerations. Jennifer’s medical bills amount to $6,000, and she misses three days of work. Jennifer sues for medical bills, $10,000 for her totaled car, wages for the days she missed work, and pain and suffering. If Jennifer proves that Amanda was at fault for the accident in civil court, she will be awarded the full amount of her medical bills, and may be awarded the actual amount of her wages for the missed days, which is $240. The judge finds, however, that Jennifer’s 10-year old car is only worth $4,000, even though she paid $10,000 for it two years ago. Pain and suffering is awarded and calculated at the judge’s discretion, but is generally equal to between 1.5 and 3 times the total medical bills. As a result, Amanda is ordered to pay a total of $28,240 to Jennifer. An order for paying restitution in a criminal matter is often fashioned in accordance with the crime committed. For example, if the defendant has been convicted of stealing tools out of someone’s garage, he may be ordered to reimburse the victim for the value of the tools. On the other hand, if the defendant is convicted of harassing homeless people down by the river, he may be ordered to perform service at the local homeless shelter as a form of restitution. Such restitution is often ordered in addition to any other punishment prescribed by the criminal code, such as jail time. Randall is assaulted by Jim as he comes out of the local nightclub. If Jim is convicted of assaulting Randall, he may be ordered to pay all of Randall’s out of pocket expenses related to the crime, including the full amount of Randall’s medical expenses and lost wages. He will not, however, be ordered to pay an amount for emotional distress. This is because restitution must be calculated precisely, based on evidence, and emotional distress is not an out of pocket expense. As a result, Jim is sentenced to serve six months in the county jail, and pay restitution in a specified amount to Randall. The victim retains the right to later file a civil lawsuit against the defendant for additional damages, including emotional distress. Restitution refers to payment made by a convicted offender or party to a civil lawsuit, as ordered by the court. Compensation usually refers to payment made to victims of violent crime from a governmental program in compensation for their out of pocket expenses for injuries and other personal losses. In many states, crime victim compensation is available even when there is no arrest or conviction of an offender. An offender may be ordered to pay compensation to the victim once convicted. In the event the victim has been compensated by the victim compensation program, the offender may be ordered to make compensation payments to the program. The primary difference between compensation and restitution is in how the monetary amount is calculated. Compensation pays for a wrong that was done. It is like a gift to apologize, and to help the victim or his family. Restitution “restores” a party or victim financially. For example, if someone is convicted of vandalizing someone’s house, he may be ordered to pay restitution in the amount the homeowner had to pay to repair the damage. The judge in a criminal matter cannot order the defendant to pay both compensation and restitution for the same losses, though he may allow the victim to choose which he prefers to receive. Often times, one amount may be higher than the other, and allowing the victim to choose is seen to better compensate him for his losses. Not all jurisdictions are allowed to give the victim a choice between receiving compensation or restitution. Many people mistakenly believe that a person cannot be sued in civil court for something that has already been tried in criminal court. This is not true. The doctrine of double jeopardy applies only to criminal cases, as these place the individual’s liberty is at jeopardy. A civil lawsuit does not ask the court to determine whether a defendant is guilty or innocent, but whether he is liable for injuries or other losses sustained by a victim as a result of the defendant’s actions. Crime victims have the right to file a civil lawsuit against an individual accused of having committed a crime against them, whether or not the accused has been convicted in civil court. Damages that may be awarded in such a civil lawsuit include expenses incurred for damages to personal or real property, medical expenses, and other out of pocket expenses. In addition, the judge may award a monetary amount for pain and suffering or emotional distress. Although, in a criminal proceeding, the defendant must be found guilty “beyond a reasonable doubt,” the standard of proof in a civil case is much easier to meet. The plaintiff must prove only that it is more likely than not, by a “preponderance of evidence,” that the defendant caused the damages. In other words, the plaintiff must prove that there is a 51% greater chance that the defendant committed the wrongful act. In a trial that lasted nine months, former football player O.J. Simpson was accused of brutally murdering his ex-wife, Nichole Brown Simpson, and her friend Ronald Goldman. Although they presented a mountain of evidence over a grueling six month period, the prosecution failed to prove to the jury beyond a reasonable doubt that Simpson was guilty. A year later, the families of Nichole Brown Simpson and Ronald Goldman filed a civil lawsuit for wrongful death against Simpson. Although Simpson had been found not guilty in criminal court, the families were successful in proving, by a preponderance of the evidence, that Simpson was liable for the deaths. The jury in this civil trial awarded restitution (civil damages) to be paid to the families in the amount of $8.5 million. The burden of this award was so great, that Simpson was subsequently ordered to turn over, not only his monetary assets, but his 1968 Heisman trophy, an original Warhol painting, and his golf clubs. Restitution in a criminal matter becomes part of a contract with the court, or the District Attorney’s office. Court ordered restitution payments may be set on a schedule based on the defendant’s income or ability to pay, and generally do not begin until after the defendant has been released from jail or prison. Not paying restitution payments as scheduled will certainly have consequences, and may result in arrest. The victim may file a civil lawsuit for the payments not made, and the arrest is likely to result in a violation of parole or probation, returning the defendant to prison or jail. On a more serious note, revocation of parole or probation wipes out any deal the defendant made with the D.A., exposing him to the maximum sentence for the crime. In addition, failure to pay court ordered restitution may incur a contempt of court charge, which is a separate criminal offense for which the offender may be fined or imprisoned. A writ of restitution is somewhat different from the concept of making court ordered restitution payments to someone due to a criminal conviction or judgment on a civil lawsuit. A writ of restitution is a court order directing the local sheriff to physically remove a tenant and his belongings from the residence he is renting. This type of court order is issued to a landlord when the tenant has failed to make payments, and has not moved out of the property. Essentially, it is a court-ordered eviction. In addition to having the sheriff physically remove the tenant, the landlord may collect the amount deemed by the court to be owed by wage garnishment, or by seizing personal property and having it sold. Civil Damages – Money awarded to compensate someone for actual monetary or property losses. Also referred to as “compensatory damages,” the amount of money awarded is based on the proven loss, injury, or harm proven by the plaintiff. Contempt of Court – A willful act of disobedience to an order of the court; deliberately being rude or disrespectful to the judge or the court. Criminal Code – Statutes setting out all criminal offences and their various punishments. Mitigating Factor – Any evidence or information presented regarding the circumstances of the matter which lessens the severity of a criminal act, or lessens the party’s level of responsibility in a civil case. Unjust Enrichment – A legal principle that prohibits one person from profiting, or being enriched, at the expense of another person. In such a case, the unjustly enriched party may be ordered to make restitution for the reasonable value of the services rendered, property transferred or damaged, or other benefits received.